With the holiday season approaching fast, there is nothing more fun than homemade ornaments! Please read below how to marble ornaments with nail polish and stuff them with delicious treats for super fun and homemade gifts this season! 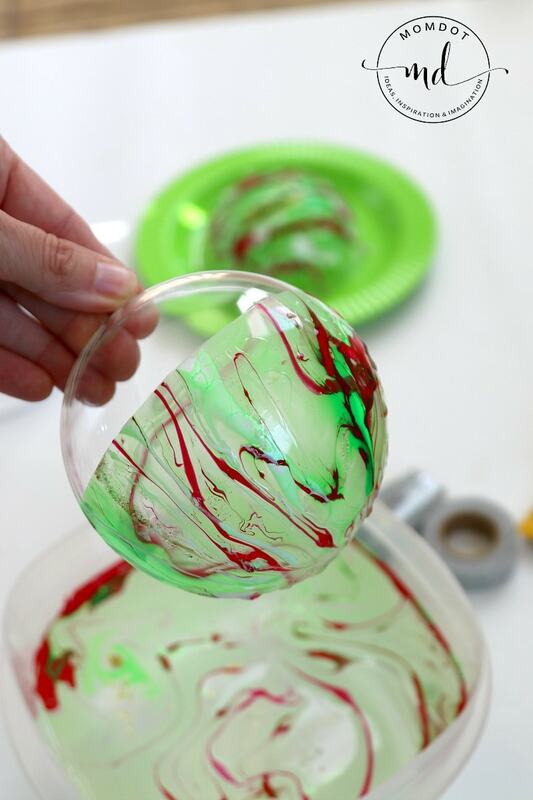 Throughout the years I have made some really fun ornaments, but nothing is more fun for kids and adults alike than marbleizing clear plastic or glass ornaments. Every color and style looks gorgeous and each ornament is so fun to hang on the tree or place in gift in boxes for a super special present. 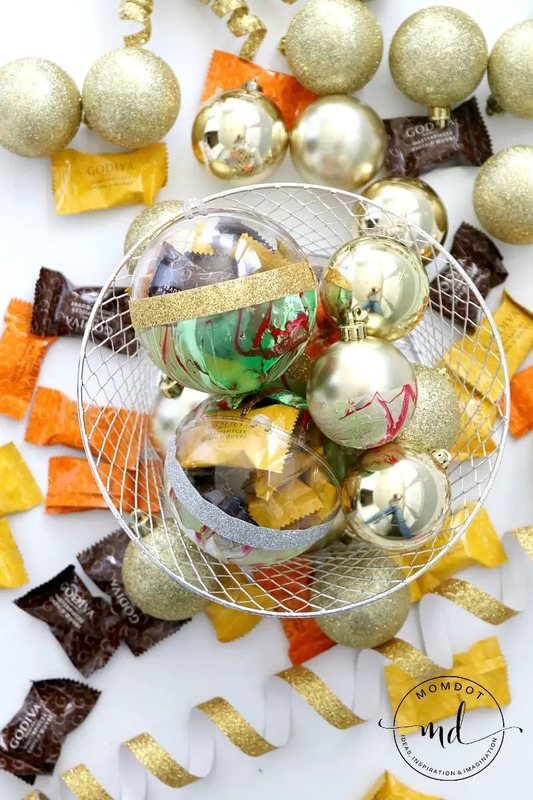 I personally love the plastic ornaments, which can be opened and filled with chocolate because, let’s face it, the holiday season is about chocolate and gifting and there is nothing better than gifting chocolate! Before you get started on this tutorial, you will need a few things. To get started, gently loosen the top on your nail polish and pour slowly into your water. The nail polish may spread or streak. Layer your ornaments into different designs. It’s fun to get creative here! Because it is holiday time, I used red, green, white and gold; perfect holiday colors! Now it’s time to dip your clear ornament! You can dip one side at a time or press together and dip as a unit. Just make sure if you dip both sides at once, you break it apart to dry so it doesn’t stick together. I find the best results is to dip straight down and go half way up the ornament. Once all your ornaments are done and dry, stuff with your Godiva Masterpieces! I love that Godiva Masterpieces are inspired by Godiva’s Signature Chocolates. Best of all? They are available as individually wrapped chocolates, which make them perfect for putting inside your ornaments. You can find them in the chocolate aisle of stores like Walmart and Target . You mean other than little pieces of perfection? Masterpieces are a new line of individually wrapped chocolates and filled chocolate bars from Godiva. Each piece is crafted in the shape of a signature Godiva chocolate and filled with smooth and creamy fillings that melt in your mouth. Once exclusive to Godiva boutiques, the iconic dark chocolate ganache heart, milk chocolate caramel lion, and milk chocolate hazelnut oyster are now available in grocery stores, drug stores, and wherever you shop every day. The dark chocolate ganache is my favorite if you are bringing some to me! Now that your ornament is filled to the brim, close it up and use a glittery piece of washi tape to seal and complete the marble line. The tape also provides an extra level of security with keeping the ornament closed. That is it! You can now either display on your table, keeping the treats front and center, gift in a box or even hang on a tree! Beautiful custom-made holiday gifting in a snap!